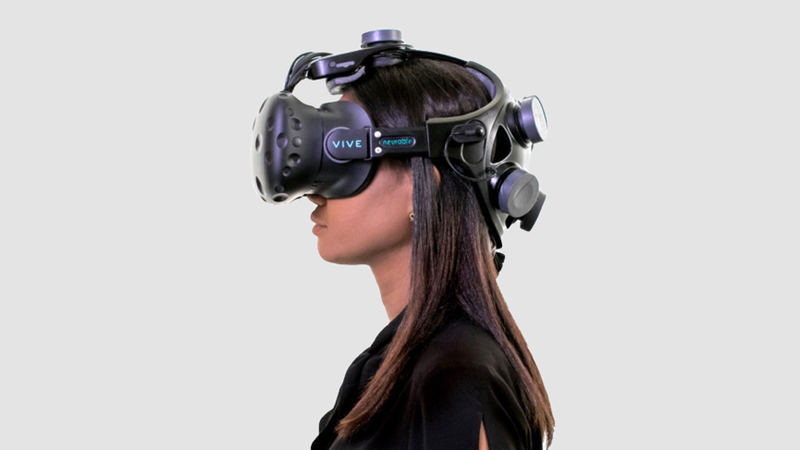 As much as we love the Oculus Touch - and as intrigued as we are by the next iteration of Valve's controllers - what if you could control VR using just the power of your mind? Neurable, a company that builds brain-computer interfaces, has unveiled a peripheral that lets people do exactly that - interact with virtual reality with brain signals instead of wands. To showcase the technology it's built a game titled Awakening, built in partnership with eStudiofuture, in which the player must use telekinesis to escape a laboratory. Neurable's device replaces the normal HTC Vive strap, and looks very Spielbergian, but the company hopes this will one day be built into VR and AR headsets, where it won't look quite so conspicuous. The company explained to Spectrum that, rather than using the EEG signals we've seen on devices like Muse's headband, it's using specific signals known as event-related potential (ERP) signals, which measure user response to stimuli. "BCIs analyze patterns of brain activity to determine user intent," wrote Neurable VP Michael Thompson on a post on Medium. "This tech is already capable of typing on virtual keyboards and controlling prosthetic limbs, entirely from brain activity." Thompson believes brain-controlled interfaces will see widespread adoption in the VR/AR space. "What the touch interface became to smart phones, BCIs will become to mixed reality headsets," he said. Earlier this year we saw MindMaze show off its own biosignal technology, which uses electrical impulses from the brain to reflect your facial expressions in VR.